Microsoft has launched what will most probably be the last Android phone from its stable. Originally showcased in June, the phone is based on Nokia’s attempt to adopt Android before they were bought by Microsoft. Nokia X2 has dual-SIM support, 4.3” WVGA screen, 1.2 GHz dual-core Snapdragon 200 processor along with 1 GB RAM. 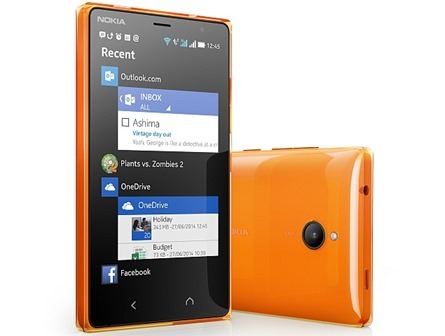 It runs on a forked version of Android 4.3- Nokia X platform. Along with this, the phone has 5 MP rear camera with LED Flash, front camera, 4 GB of internal storage with micro SD Card support. Microsoft has also updated the software for X2 recently that added Gmail client and Google contacts sync. 1. It is priced at Rs. 8699 where it wants to compete with Moto E and Xiaomi’s Redmi 1S. 2. The whole lineup is already going to be shutdown by Microsoft. What this means is that buying this phone is as good as buying two year old dead batteries. As good as Nokia X phones might have been, the whole reason to buy any phone is to get good support and value for money from the product. This phone cannot offer anything. In its price range, the competition is fierce. Asus Zenphone 4 has similar features and is priced at lower Rs. 5999 mark. Moto E is priced at Rs. 6999 and offers exactly the same set as Nokia X2 and has the added advantage of Play store which gives a plethora of applications to user. On the other hand, developers won’t touch Nokia app stores as there is nothing to do there anymore. Redmi 1S beats Nokia X2 out of the water with its 1.6 GHz quad core processor, HD screen and 8 MP camera. To top it, the phone is priced at Rs. 5999. Its only negative is that it is not available in the market freely and you have to depend on luck to get one immediately. Even if you do not want to buy Redmi 1S, Moto E offers a similar brand name while giving better value for money. Now I understand that because Microsoft had probably already started the manufacturing of these phones when they decided to scrap the Nokia X project and hence they want to sell the phones off. But it still sits uncomfortably with me that the company is counting on people’s love for Nokia or their ignorance of the fact that the phones are already a part of past. What do you guys think? What will happen to Nokia X2 now? No. Discontinuing production of x series phones won’t affect x2 users. Because users do not have to do any thing with the production of these phone. They have a good phone and they will keep enjoying their phone.